All ages; 14+. Spaces are limited; Register with form at the bottom of this page. Introduction to Mural Art is a free visual art learning program for all ages (14+) and abilities. 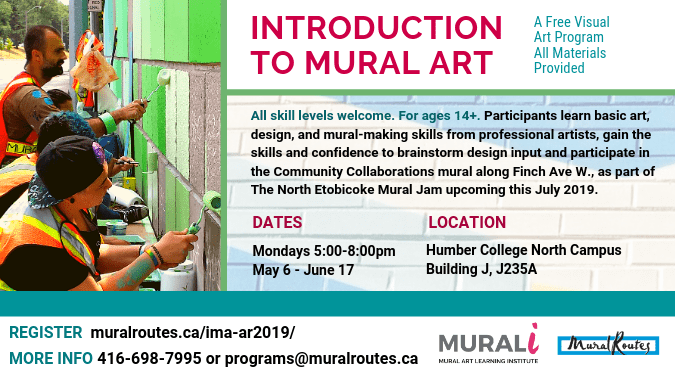 Participants learn basic art, design, and mural-making skills from professional artists, gaining the skills and confidence to brainstorm design input and participate in the Community Collaborations mural along Finch Ave W., as part of The North Etobicoke Mural Jam upcoming this July 2019. Introduction to Mural Art is comprised of six workshops, each three hours in length. Workshop topics include: mural styles, collaboration, drawing and painting techniques, colour theory, design challenges, mural techniques, enlarging techniques and large-scale collaborative final design projects. Each program aims to connect with a local mural project in the community where the program is being presented. This program is a part of a larger initiative, led by Arts Etobicoke and in partnership with Mural Routes, The STEPS Initiative and Womxn Paint. Mural Routes would like to acknowledge the ongoing support of Toronto Arts Council and the Ontario Arts Council, an agency of the Government of Ontario.